After a mediocre performance at Ironman South Africa in March, I was really motivated to work hard on improving my running. With the help of a friend, Alec Riddle, who has coached several top marathoners to 2:10 – 2:12 marathons, we slowly made headway into improving my base pace. After a couple of months I was comfortably able to run at 4:15 per km as a training run, and sub 56 minutes for a 15km Tempo run without going over 150 beats per minute heart rate, so I was sure that things were on track. I was planning to do several other half Ironman distance races, none of which ever materialized because of the bad weather we were having, we eventually decided to do UK Ironman 70.3. The night before the event my bike was stolen out of the transition area along with two other bicycles. After the first lap on a borrowed bike that was too small for me, I decided to call it a day. Disappointed? You have no idea. Time, effort, and money wasted. Worst of all, I wasn’t able to test my form or my equipment for Hawaii. My preparation for Hawaii was almost flawless, save for a couple of days missed due to extensive flooding here in Port Elizabeth. Over a sixteen week period I spent a total of 500 hours training, more than ever before, but also with more recovery than ever before. I really felt that I was in the best shape of my career, and ready to take on the best. A week and a half after our arrival in Hawaii, while I was making dinner in the kitchen, I stood on a bee that promptly stung me on my toe. Now I’ve been stung many times before in South Africa, no big deal, but this one hurt like hell, and worst of all, caused major swelling and itching. I continued to train through it, although with some discomfort and blistering, but knew I still had 2 weeks to recover before the race. The rest of the taper went well, and after the initial lethargic feeling, I could feel the power coming to me. Tuesday morning, while out on an easy ride, another bee flew into my shoulder, fell onto my upper right thigh and stung me. By Wednesday morning I had one triathlete’s leg and one rugby player’s leg, and running was very uncomfortable. By Thursday there was no change, and we decided the only option was to get medication. After 3 courses of anti-histamine, by Friday night my leg started to look something like normal again. Race day started at 4 o’ clock in the morning with breakfast. My leg looked fine, and I felt OK. All the pre-race preparations were smooth, and during warm-up I felt OK. When the cannon went of I got into a good pack and managed to get near the front. Around the mid-way turn I was swimming next to Luke Bell and Cameron Brown, so I knew I was exactly where I wanted to be. But about 1km from the end of the swim, I started cramping severely in my calf and upper thigh, so severely that I had to stop and stretch and swim a few breast strokes to try get rid of it. After about a minute I was able to start swimming normally again, but I had lost the guys I wanted to be with. From then on, everything became a struggle. Onto the bike, I felt terrible from the first stroke, my legs were aching, but I just kept telling myself to keep going and that it would get better. I had to work hard to stay with Rutger Beke, and he eventually dropped me at about 30km, but I knew I would catch up to the main bunch again, which I did at 60km. The whole time however I was fighting to hold back the nausea, which was forcing me to bring up any GU gels that I tried to eat, but I kept telling myself to keep going because it would get better. By the last 40km all I could stomach was water, all my own nutrition had gone out the window, and I pretty much knew the writing was on the wall. I finished the bike leg way down in 26th position, and thought if I could just feel better on the run, I might still be able to pull of a top 10 finish. I felt comfortable for the first 8km, running at about 4min/km, but after I made the turn I really started to battle with my leg. Every now and again, it felt as if the tendon next to my hamstring was going to snap, and I was forced to stop and wait for it to pass. At about 12km I pulled of the course and walked down to our condo, but realized that Natalie probably wouldn’t be back for hours, so I continued to run and stop for the next 4km, and when I got back to where Natalie and the kids were waiting, pulled off the course for the final time. My day was done. Every athlete goes through good times and bad times in their career. In a career as long as mine, you can go through bad periods on a few occasions. This isn’t the first time I’ve had a bad season (hopefully it is the last), so I know I’ll come back stronger and more determined to prove that it was all just bad luck. I know I was in great shape, and that my training was perfect, I was just having a bad day due to circumstances beyond my control. Unfortunately, when you train for Ironman, it doesn’t leave you much opportunity to do other races. If you race well at those Ironman events, it doesn’t really matter because your sponsors are getting coverage from the biggest events. This has been a tough year for me, but even more so for my sponsors. 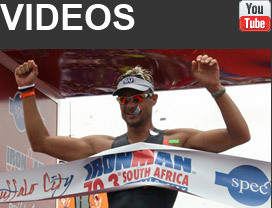 So my plan for 2007 is to do as many other races as I can as part of my preparation for Ironman. This means I won’t be able to train as hard as I did before, but I will be able to get more coverage for my sponsors, which will hopefully make them happier, and we’ll be able to continue our relationships in the years to come. Therefore, my goal races for the next few months will be the half Ironman races in Worcster in December, Durban in January, Vanderbijlpark in February, and finish of with the big one in Port Elizabeth in March. Anything less than victory, will be regarded as a failure. A big thank you to all my sponsors, without them I wouldn’t be able to work as hard as I do on achieving the success that I want. Their support is crucial for my continued improvement, and hopefully 2007 will be a hugely successful for me and beneficial for them. Thank you also to everyone who personally attended andwho supported my fundraising event in September, both those who supported in their individual capacity or as groups or corporates. Then, thanks to everyone who supported me while I was away in Hawaii. I received numerous emails of well wishes for the race, which is greatly appreciated. It’s amazing how many people out there follow the sport of Ironman and hopefully I’ll see you all at Ironman South Africa in March 2007.